I loved this New Yorker cartoon in the March 24th issue, which also has a profile of New York chef David Chang I plan to read right now. UPDATE AND NOTE TO READERS, 3/31: Pardon my barging into a previous post, but I need to point out that I’ve deleted the New Yorker cartoon I photographed and reprinted in this space on Friday. I ditched it because I neglected to consider copyright issues when posting, and thought I’d better hit the “buh-bye” button before someone gave me legal grief. So, now you need to go find the 3/24 issue (the one with Spitzer in his boxers on the cover) and look for Danny Shanahan’s cartoon involving an eagle landing in a nest with a dead bunny and a basket full of candy. Three eaglets are checking out the carnage and the caption reads: “The candy is for after dinner” — famous last words in my house. As for that David Chang profile: amazing. Writer Larrissa MacFarquhar peeled the onion for an honest look at New York’s hot young chef. Yes, he’s neurotic, and has anger issues, and he’s first to say so, but you can’t help respecting Chang after reading this revealing piece, centered on the opening of his latest restaurant, Momofuku Ko. 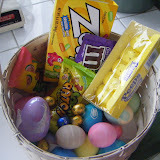 And here are the spoils from my son’s Easter basket. He was thrilled to see that the Easter Bunny had brought Zours. Peeps? Not so much. The Bunster was thrilled to wear “his” new Panther Vision ball cap with the heavy-duty flashlight in the rim, when he stopped by late last Saturday night. I understand it was pretty dark out there when he was hiding those plastic Easter eggs. I’m going to try to restrain myself from blogging over the weekend. It’s a fun job, but hey — it’s still a job! Talk later. . .